Spain's Sergio Garcia posted a seven-under 65 to claim the halfway lead at the Houston Open. The 34-year-old's bogey-free round enabled him to match the 36-hole course record of 12 under and lead by one shot from America's Matt Kuchar. "Obviously I feel good, but every week is different," said Garcia, who is preparing for the Masters next week. Ireland's Padraig Harrington, needing victory in Houston to qualify for Augusta, missed the cut after a 79. Northern Ireland's Rory McIlroy is nine shots off the lead after a second-round 71. Englishmen Lee Westwood and Luke Donald are a shot further back while countrymen Paul Casey and Ian Poulter joined Harrington in missing the cut. 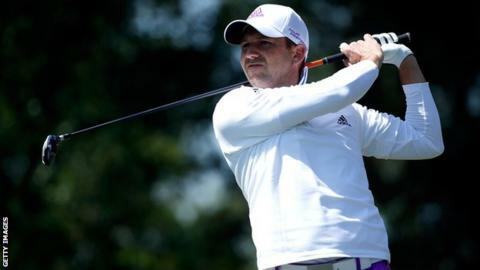 Garcia's round, which included an eagle and five birdies, gave the world number eight a timely lift as he prepares to head for Augusta still in pursuit of his first major. He lost out in a play-off at the 2007 Open at Carnoustie and finished runner-up at the US PGA in 1999 and 2008. "First of all, we've got to finish this week, and hopefully next week I'll be feeling good and not too many things will be bothering me health-wise," he said. Garcia needed only 25 putts during his round and equalled the course's previous best score for 36 holes, set by Johnson Wagner in 2008 and matched by Jeff Maggert four years later. Kuchar briefly tied the lead with the Spaniard at 12 under before a bogey on the 18th saw him finish with a five-under 67. The two will play alongside Australian Matt Jones on Saturday after tournament officials opted to send threesomes off both tees early in the morning in an attempt to beat expected rain in the afternoon. Live BBC Two coverage on 12 April from 19:30 BST and on 13 April from 18:00 BST. Live Red Button, online and mobile coverage of Amen Corner from 18:00 BST on 12 and 13 April. Daily live text and radio commentary.